The program includes the most famous and the most interesting cities , monasteries and cultural sites of Bulgaria. During these 9 days the tourist will visit monasteries and churches (near Russe, in VelikoTarnovo and Arbanasi, Dryanovo and Shipka, Stara Zagora and Nessebar), Thracians tombs in the Valley of the Thracian kings, ancient Roman monuments in Plovdiv and Stara Zagora, beautiful Bulgarian houses from 18-th and 19-th centuries in Veliko Tarnovo, Arbanasi , Plovdiv and Nessebar. The tourists will visit 3 sites from UNESCO’ world cultural heritage list. The program includes also a 3-days stay at the Black Sea coast with free time to relax on the sandy beaches and enjoy the warm sea water. Arrival at the Bucarest airport. Departure to Russe (100 кm, 1,30 h). Check-in in the hotel or departure straight to Ivanovo (depending on arrival time). The rock monastery “St. Archangel Michael” is situated 22 km from Ruse, in close proximity to the village of Ivanovo. The monastery was founded in the 1220s. Wall-paintings which show the specifics of Bulgarian church art in the 13th – 14th centuries are preserved in six temples. The wall paintings in the church “St. Mary” are world famous. Their exceptional artistic qualities are the reason for their inclusion by UNESCO in the list of the global cultural inheritance. The next monastery, the Bassarbovski Rock Monastery “St. Dimitrius Bassarbovski”, is situated only 12 km from Ivanovo, near the village of Bassarbovo, in the valley of Russenski Lom river (10 km from the town of Ruse). Departure to Russe.Walking tour of the center of the city. Overnight. The upsurge of Veliko Tarnovo is related to the period of the Second Bulgarian Empire (1185 – 1393). In 1185 the town was declared a capital of the restored Bulgarian State. After its selection to be a capital, the town developed fast, as within the period 12th – 14th century it was the most unconquerable Bulgarian fortress, as well as a cultural and intellectual center of Bulgaria. Visit of the most significant monument of culture in Veliko Tarnovo - the medieval fortress Tsarevets, situated on the homonymous peak, surrounded on three sides by the river Yantra. 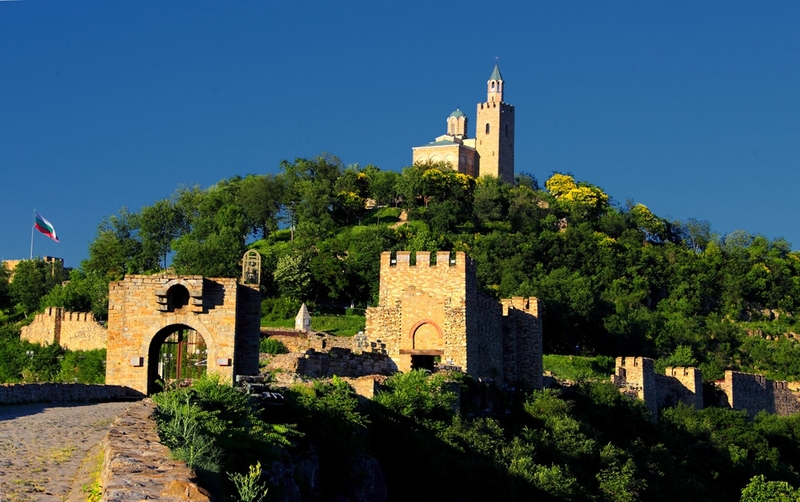 Besides its historical hills, Veliko Tarnovo is also famous for its multiple orthodox temples.–1273). Visit of Samovodskata Charshia (the crafts street), the town guests have the opportunity to see houses over 200 years old, and to feel the of completely different atmosphere. Visit to the village of Arbanasi. It is an archeological reserve and is located on a high plateau, 4 km from the city of Veliko Tarnovo. The village existed during the Second Bulgarian State (1185 - 1393). Traders from Arbanasi were renowned and traded throughout the whole Turkish Empire. Back to Veliko Tarnovo. Overnight. Breakfast. Departure to Dryanovo ( 22 km, 30 min). For centuries the Dryanovo Monastery “St. Archangel Michael” has been one of the centers of development of the Bulgarian Christianity and culture. Departure to Etara (25 km, 30 min). The Architectural And Ethnographic Complex Etar is situated at the outskirts of the town of Gabrovo. It is an open air museum. It presents the architecture and the style of life in Gabrovo and the region during the second half of the 18th century and the beginning of the 19th century. There are about 50 sites – houses with craft workshops, water installations and other buildings. Optional lunch. Departure to Shipka Monastery (31 km, 50 min). The road is climbing the highest pass of Stara Planina mountain – Shipka. The Shipka Monastery is at the foot of the south slope of the mountain. Departure to Kazanlak. (14 km, 15 min). Kazanlak is the capital of the Roses Valley famous with the essential rose oil and rich with more than 4 000 ha of rose plantations. On the road visit of the the tomb of the Thracian king Sevt III situated in the Golyamata Kosmatka mound, 1 km southern from the town of Shipka. Tomb was built in the second half of 5th century BC. Visit of the the Kazanlak Tomb, thracian tomb from 4th – 3rd century BC. It is under a special storage regime. Its replica, constructed in scale 1:1, which presents the architecture, the archaeological materials and the wall-paintings of the Kazanlak Tomb, is situated next to it. This Tomb is one of the most significant monuments of the Thracian culture in the Bulgarian lands, included to the list of UNESCO global cultural heritage. Visit of the Historical Museum in Kazanlak. In the exposition entitled “Archaeology” are presented the Thracian temple tombs and multiple objects and gold items found in the mounds near Kazanlak (such as Golyamata Kosmatka, the Maglizh tomb, etc.). Departure to Plovdiv (104 km, 1, 45 min). Plovdiv is the second largest city in Bulgaria. It is one of the oldest cities in Europe – the beginning of its history dates back to 4,000 years BC so it is over 6 000 years old. Numerous well-preserved artifacts had remained from those times, such as cobble stoned streets, fortress walls, buildings, water supply and sewerage systems. The ancient theater was constructed during the rule of Emperor Trajan (beginning of the 2nd century) : the Roman stadium, the Ancient Forum, the Odeon, Irene Residential House with very rich mosaic decoration. The Ancient Plovdiv is an architectural reserve. Beautiful, richly ornamented houses are emblematic for the Old Town of Plovdiv. The walking tour includes all these historic sites. In the evening visit of the Ancient forum, the Rome Stadium and the central walking street plus the famous with its cafes, bars and restaurants quarter Kapana. Overnight. Breakfast. Visit of the Old Town and the Ancient Theater. Departure to Stara Zagora ( 100 km, 1,15h). The town is one of the oldest in Bulgaria with a history beginning 8 000 years ago. Here are the best preserved dwellings in Europe from the Stone Age, 6th millennium BC. The Antique Forum of Augusta Trayana is a must for the visitors of the city. The Museum of Religions is unique with the 3 sanctuaries under one roof: Thracian sanctuary, medieval Christian church and a mosque. Hilendar Closter is situated in the yard of the church Saint Dimitar. Visitors can see meticulous restoration of a classroom in the Saint Nicholas boys’ school, the first one in the region, opened in 18-th century. Departure to Nessebar (Slanchev briag, Sveti Vlas) – 200 km ( 2,10 h). Visit of the Old town of Nessebar which its Architectural-Historical Reserve, included to the List of UNESCO World Cultural Heritage. Nessebar is one of the most ancient towns in Europe, founded 3200 years ago. Day 5 – Day 7 – free time to enjoy the sunny beaches and the warm sea. Breakfast. Departure to Varna. The town was established in the 6th century BC under the name of Odessos by emigrants from the town of Milet in Asia Minor. For a short time it turned into a polis and one of the most important ports and commercial centers on the Black Sea. The Roman Baths are one of the most valuable monuments of culture in Varna. The Public Baths of Odessos (1st – 4th century AD) are the largest roman bath on the Balkan Peninsula – with an area of 7000 square meters. It is the forth in size in Europe – among the baths of Karakala and Diocletian in Rome and Trevira (Trier, Germany). It was used by the end of 3rd century. The oldest golden treasure in the world was found in an Eneolithic necropolis, near Varna city. The treasure has an exceptional value because according to scientists it dates back to the 6th millennium BC. (8 000 years old). Necropolis’ artifacts are displayed in Varna’ Archaeological Museum. Breakfast. Departure to the airport of Bucharest. Single supplement - 100 euro. Dinners supplement for 5 dinners (without drinks) and 3 AI – 122 euro/pp.